We can see the digital revolution in education. Tools are available to efficiently use them and implement VR creation to show to the students. The concept of Virtual Reality in Education is gaining success, and it is applied to wide range of activities in different subjects. VR in education and training not only gives an immersive experience to the students but also adds fun to the learning sessions. Students engagement increased. This also leads to higher levels of participation. Why Virtual Reality in Education? We are always looking for ways to make the transfer of knowledge easy and quick. Digital devices and technology are giving better opportunities for knowledge transfer. Virtual Reality is being used to enhance the learning and engagement of the students. VR effectively transforms how the content delivered. As the students immersed in the topic, they can fully understand it. Practical experiences allow students to understand the working of things, but this can be expensive. But a small, inexpensive VR device can act as a science lab. VR experiences remain in the memory of the students for long. VR is used not only for content consumption but can be an excellent tool for content creation. Give easy to use VR tools to students and boost their creativity. Here are few ways in which Virtual Reality is being applied in education. Students can virtually visit the places that they cannot physically visit. Compared to reading, hearing learning is more effective when something done physically. With Virtual reality, students can experience the activities that they are supposed to learn. Virtual campus visits offered by many colleges and schools for students who are trying to find the best campus to study. Virtual campus visits make it easier for the students to decide about taking admissions. One of the best applications for virtual reality is architecture. A building can explore even before the construction begins. Design application is not just for architecture field, but schools and colleges are also taking advantage of this technology to create historical sites, etc. Virtual Reality in Education offers many benefits. With virtual reality becoming increasingly accessible, usage of VR in teaching and learning is increasing. More and more creators are blending VR in the production of educational content. Virtual Reality or 360-degree videos work as personal field trips to the students. While watching the videos, the students transported to a place or places that would be inaccessible otherwise. They can explore the depths of oceans, heights of mountains or go into the crests of the earth. They can explore the distant planets; feel what it is in space etc. More complex subjects can be understood easily with the help of VR. 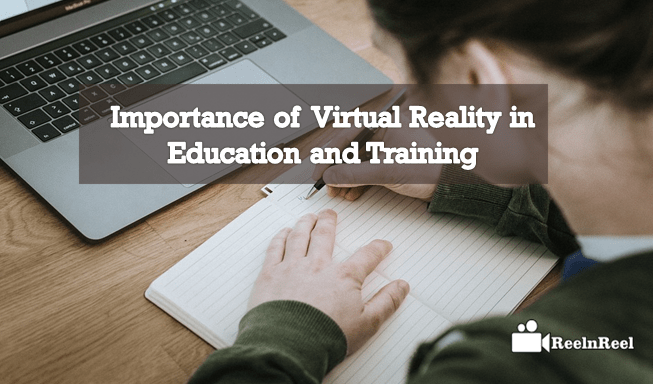 Though the usage of virtual reality in education and training used extensively, it cannot be said that there are no disadvantages in this. This type of teaching lacks personal human communication and interpersonal connections. In the traditional classroom, questions can be asked, answers are received but using VR headset is a different experience. There will not be any flexibility which can prove to be a disadvantage for the students. Something may go wrong with the devices or tools, and learning activity will \stopped. There is another significant danger which is that the students might get addicted to the virtual world. Virtual reality is revolutionizing the education field. The present hot topic is the practical applicability of VR in education. Specific practical applications of VR can see in the market. An object of study can explore from all the sides with a virtual panoramic tour created with images and text. VR will be more immersive when it comes to teaching the basics of science. The solar system can be understood better when tools such as VR interactive games are used. One of the significant problems for students with Mathematics is to understand the basics. Virtual Reality can be used to bridge that gap by presenting immersive visualization with VR. For example, virtual objects are used to represent algebraic problems so that it becomes easy for the students to understand and remember. There are different sides to Virtual Reality – the development of software content and hardware. More and more affordable head-mounted displays are now available in the market. Samsung Gear, Google, and Sony Headsets, Oculus Rift are some of the hardware devices available. There is also need to upgrade the PC hardware to run VR applications. Teachers believe that VR improves the teaching in classrooms. They expect that Virtual Reality is going to be commonplace in educational institutions in the coming few years. VR could prove to be advantageous for institutions such as medical school. Mobile VR is the most accessible now. But there is an only limited number of VR apps on the market. Finally, the goal of virtual reality in education is to make the process of studying and learning active and exciting.